Eating two kiwifruit a day can improve a person's mood and give them extra energy, new research from the University of Otago, Christchurch (UOC) shows. Professor Margreet Vissers and her team from the UOC's Centre for Free Radical Research are involved in a large on-going study to better understand the critical role of vitamin C in the human body. 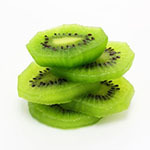 Professor Vissers says "the two kiwifruit per day ensured that the study group's vitamin C levels were optimal, and this was needed to see an effect on mood and energy. The amount of vitamin C required for this is higher than the current recommended intake. Our study provides good evidence to support the view that there are measureable health benefits to be obtained from eating a good amount of fruit and vegetables daily. For best benefit, it is important to include high vitamin C foods in your daily diet." A list of Otago experts available for media comment (http://www.otago.ac.nz/mediaexpertise) is available elsewhere on this website.